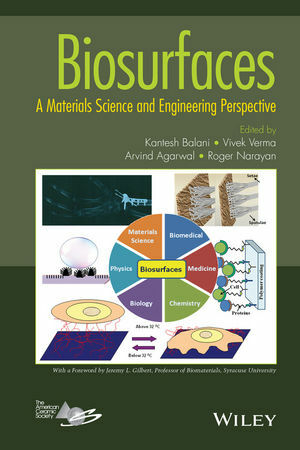 Ideal as a graduate textbook, this title is aimed at helping design effective biomaterials, taking into account the complex interactions that occur at the interface when a synthetic material is inserted into a living system. Surface reactivity, biochemistry, substrates, cleaning, preparation, and coatings are presented, with numerous case studies and applications throughout. Kantesh Balani, PhD, is an Associate Professor, in the Department of Materials Science & Engineering, Indian Institute of Technology (IIT) Kanpur. He has presented over 50 lectures in the international conferences and has over 65 publications in the peer-reviewed international journals. His accolades include the 2013 P.K. Kelkar Research Fellowship. Arvind Agarwal, PhD, is Professor of Materials Science and Engineering in the Department of Mechanical and Materials Engineering at the Florida International University (FIU), Miami, Florida, USA. He has authored more than 200 publications, edited 7 books, and co-authored 1 book in the area of coatings and nano-biomaterials. His accolades include Fellowship of ASM International. Vivek Verma, PhD, is an Assistant Professor in the Department of Materials Science and Engineering at Indian Institute of Technology (IIT) Kanpur. He is a recipient of the prestigious American Academy of Mechanics Founder’s prize and grant for the year 2005-06 and Shri Ram Arora Award 2011. Roger Narayan, PhD, is Professor in the Joint Department of Biomedical Engineering at the University of North Carolina (UNC) and North Carolina State University (NCSU). He is an author of over 100 publications as well as several book chapters related to biomedical materials. His accolades include the UNC Jefferson-Pilot Fellowship in Academic Medicine.